Record breaking heatwaves have turned the south west of the US into 'Dante's Inferno,' with the heatwave to carry on well into this week! Wildfires in California are quickly spreading, forcing hundreds of people to be evacuated, officials say, while an entire town has been evacuated due to fires in Arizona. A combination of high temperatures of around 45 deg C, (113 deg F) and parched land has added to the difficulties of firefighters. A firefight was continuing in Santa Barbara County on Sunday as crews were battling out-of-control brush fires, one of them trapping dozens of young Southern California campers. The Whittier Fire near Lake Cachuma burned 7,800 acres and counting. Only 5 percent of the blaze was contained as of Sunday evening. Fire officials said vehicles and structures have been lost. They don't have any numbers yet on damage, as it has been too dangerous for crews to get back into those areas. The blaze broke out about 1:45 p.m. Saturday afternoon near the Whittier campground. The wind helped push the flames over Highway 154, which closed down from Highway 246 to State Route 192. Saturday night, there was a happy reunion for the parents of about 80 kids, many from the Los Angeles area, who were trapped by the flames near a campground. About 200 children at the summer camp were quickly evacuated, but some ended up hunkering down with firefighters and sheriff's deputies until the fire moved through the area. Officials said the fuel-driven fire was racing through thick, dry brush and grass in an area that hasn't burned in more than 60 years. Adding to the challenge is the lack of crews due to the number of fires burning in the west. 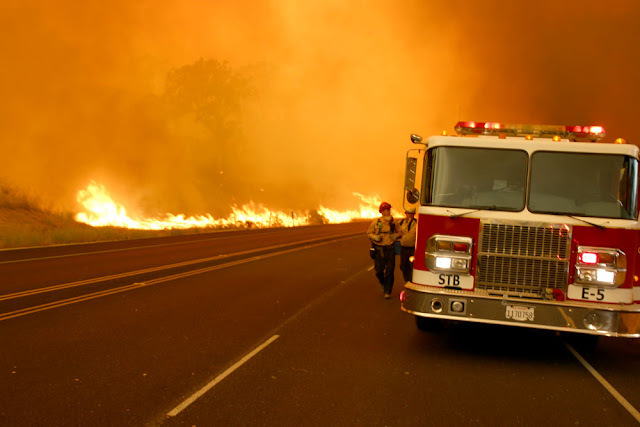 The Alamo Fire along the border of San Luis Obispo and Santa Barbara counties was burning nearly 24,000 acres. About 3,500 residents have been evacuated due to the Whittier Fire. A rural Arizona county has declared a state of emergency after a wildfire charred up 10 buildings. Fire officials said the burned structures included three homes that had already been evacuated, as the entire town of Dudleyville, about 100 miles (160 kilometers) southeast of Phoenix, has been ordered to flee. The wildfire is primarily along the San Pedro River and is about a half-square-mile (1.4-square-kilometers) in size. The brush fire burning salt cedar started Friday night. Evacuations have also been ordered for the Bridge Canyon Estates subdivision near the town of Seligman, nearly 200 miles (322 kilometers) north of Phoenix. The small fire burning brush and grass was started Saturday afternoon by a lightning strike.